In comparison to the multi-million dollar star-studded display of excess that is the modern day Academy Awards, the first Academy Awards ceremony was a relatively muted affair that could even be described as quaint if you were so inclined. Held in a medium-sized banquet hall in a Hollywood hotel mostly known for being haunted today (Hollywood Roosevelt Hotel), the May of 1929 event wasn’t even broadcast to the public in any form. As unbelievable as it may seem given how massively popular the Academy Awards are today, the idea of an awards ceremony to celebrate various achievements in filmmaking was initially thought to be absurd. You see, few in Hollywood believed that any members of the studios within the industry would vote for anything but their own films. As for the Academy of Motion Picture Arts and Sciences itself, it was a relatively new organization, in part formed by producer Louis B. Mayer in 1927 with the intent of uniting the various branches of filmmaking, as well as to try to curtail these entities from unionizing. After the war, Duncan brought the two dogs back to the states with him, with Rin Tin Tin ultimately becoming a huge star in Hollywood, prominently appearing in a whopping 27 films during his career, almost singlehandedly popularizing the German Shepard breed in America and playing a large part in keeping the struggling Warner Bros. afloat in the early days. In the year leading up to the first Academy Awards, he also starred in four hit films, Jaws of Steel, A Dog of the Regiment, Tracked by the Police, and Hills of Kentucky. (You can watch Rin Tin Tin in action in that one here, valiantly defending little Davey from a pack of wolves). So when said award ceremony came around, the story goes that he, naturally, won best actor. But as a huge point of the Academy Awards was to try to make filmmakers and their films seem more important and prestigious, having a dog win one of the top awards didn’t sit well with the organizers, so the Best Actor award instead went to Emil Jannings. Or, at least, this is the story off repeated on the interwebs, even on some of the most otherwise reputable sites. So is it true? When the first Academy Awards were held in 1929, votes were cast well in advance and, unlike today, weren’t kept a secret at all. As a result, all of the winners (and losers) that first year knew well ahead of time, as did the public. In fact, the LA Times published the results about three months before the ceremony took place. From the fact that these ballots were public (and they still exist in the archives at the Academy’s Margaret Herrick Library), we know definitively that Rin Tin Tin didn’t even come close to winning Best Actor, receiving only a single mocking vote by Warner Bros. executive Jack Warner, contrary to what almost literally every source we could find on the matter states. The genesis of the rumor that he not only did receive many votes, but won, can be traced back to a different Warner Bros. executive, Darryl Zanuck. He was one of many who initially thought the Academy Awards were a stupid idea. The story goes that when he first caught wind of a ceremony celebrating Hollywood, Zanuck wrote a letter to Academy executive Frank Woods that including a faux ballot that only nominated Warner Bros. features and workers to demonstrate what he believed would happen if the idea became reality- that everyone would just vote for their own stuff. He then further showed his contempt for the idea by writing Rin Tin Tin’s name in for Best Actor. Zanuck (who actually became a strong proponent for the awards in later years) evidently told this story one too many times at a cocktail party or two, leading to it becoming enshrined in Hollywood lore and repeated ad nauseum, which in turn resulted in the story ending up in a 2011 book by Susan Orlean, Rin Tin Tin: The Life and the Legend . The news media picked up on this, spreading the legend as fact, and seemingly few have bothered to look into it from there. The truth is that when official ballots were actually cast, Zanuck didn’t even bother voting, joking or not. So, sadly, despite arguably being one of the most popular stars in Hollywood and, by all accounts, a very, very good boy, Rin Tin Tin was completely snubbed by Hollywood insiders thanks to their blatant and unapologetic speciesism. And so it was that German actor Emil Jannings, who would later go on to make many Nazi propaganda films, was honored instead… As for Rin Tin Tin, he remained a good boy and, despite being a German (shepherd), never appears to have had any Nazi leanings. On top of that, he doesn’t appear to have ever discriminated against anyone based on their species, race, nor seemingly had any prejudices of any kind, except (presumably) a deep loathing of mailmen. What Happens When Stars Lose Their Oscars? 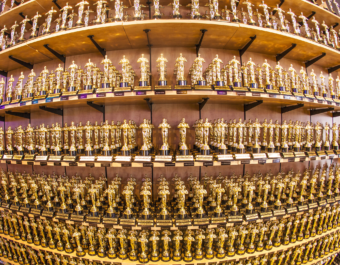 Why are the Oscars Called the Oscars? Why are the Emmy Awards Called Emmys? It’s comin’. Oh, it’s comin’.